Date of birth unknown. He started his career at the Takeda no Shibai, a hama shibai venue, performing under the name of Takeda Tanin. 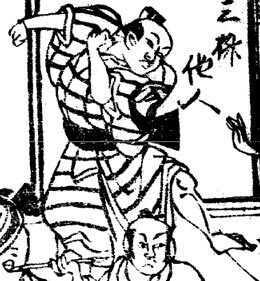 He became a disciple of Mimasu Daigorô I and received the name of Mimasu Tanin at the end of the 1750s. Later on, he was adopted by his master. He appeared on stage for the last time in the 2nd lunar month of 1770, playing at the Kado no Shibai the role of Takuma Kujûrô in the drama "Higashiyama-dono Onna Makigari". He died the 27th of the 11th lunar month of 1770 . 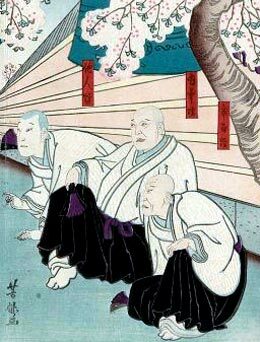 He was a supporting actor of the Mimasu clan, performing either as a tachiyaku or a katakiyaku. 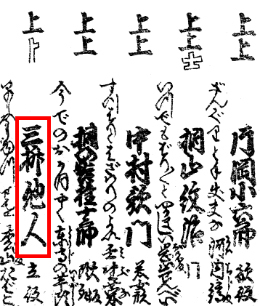 The actor Mimasu Daigorô II held the name of Mimasu Tanin II from 1774 to the 2nd lunar month of 1781. The actor Mimasu Daigorô IV held the name of Mimasu Tanin III from the 11th lunar month of 1815 to the 10th lunar month of 1820. The actor Mimasu Daigorô V held the name of Mimasu Tanin IV from 1831 to 1845. Date of birth unknown. The first stage name of this Kamigata actor was Onoe Mankichi. 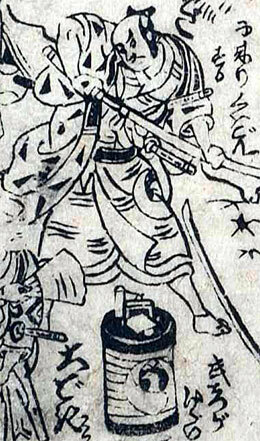 He became a disciple of Mimasu Tanin IV and received the name of Mimasu Kuranosuke II. He was adopted by his master and took the name of Mimasu Tanin V around 1849. He held this name up to his death in 1859. Date of birth unknown. 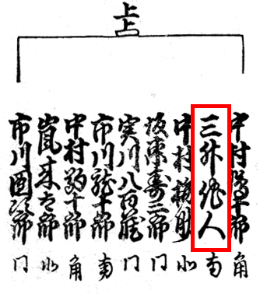 Son of Mimasu Baisha I, his first stage name was Mimasu Fukunosuke II. He took the name of Mimasu Tanin VI in 1860 and held it up to his death in 1864. The actor Nakamura Baigyoku II held the name of Mimasu Tanin VII from 1865 to the 2nd lunar month of 1868. Dates of birth and death unknown. He started his career in kodomo shibai during the 1860s, performing under the name of Nakamura Komajirô. He most likely became a disciple of Mimasu Daigorô V and took the name of Mimasu Tanin VIII in 1872. He held this name up to 1917. No record afterwards. The 27th of the 11th lunar month of the 7th year of the Meiwa era was the 12th of January 1771 in the western calendar.